I know a lot of people really get intimidated by roasting a whole chicken. It seems difficult and time consuming, but it really IS simple. Buy chickens when they are on sale and cook them for Sunday supper. Add some mashed whipped sweet potatoes, fresh green beans, roasted cauliflower and homemade sprouted wheat bread and you have a meal your grandma would be proud of! Pro Tip: Be sure to have an instant read thermometer on hand for this. They are super cheap at Target or WalMart, or Amazon. You want the temp to be 155 in the breast before you remove from the oven. Rinse the chicken, inside and out. Remove the gizzards from the cavity and discard or use in something else. Place the carrots, celery and onion in the bottom of a shallow baking dish- this is your rack. In a small bowl, mix the minced garlic with a few thyme leaves, oregano leaves and a pinch of salt and pepper. Loosen the skin on the breast of the chicken and put this mixture under the skin, spreading it out as much as you can. Place the lemon, fresh herbs and whole garlic cloves inside the cavity. Brush or rub the outside of the chicken with a little olive oil (phase 3 only) and sprinkle the bird generously with salt and pepper. Place him on the veggie rack in your pan. Put the chicken in a hot oven- 475 degrees, for 15 minutes. Reduce heat to 375 and cook until temps reach 155 degrees (use instant read thermometer). It should take 15-20 minutes per pound. Check temps at 30 min, depending on size of the bird. Once you remove the chicken from the oven, cover with foil and let the bird rest for 15 minutes. Remove the lemon and herbs from the cavity and carve. 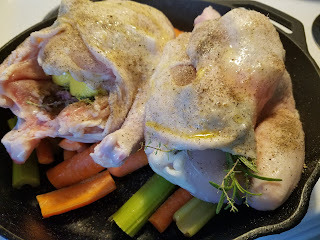 Put the veggies and remaining contents of the pan, along with the chicken bones in a large stock pot and cover with water. Throw in a bay leaf and simmer for 2-4 (or more) hours for a delicious chicken stock. Strain, cool and discard the veggies and bones. The breast is the only part we can eat on P2 am I correct? Dark meat is only on P3.